Figure 15. Location and aerial views of the Rocky Flats Site (modified from DOE 2017). 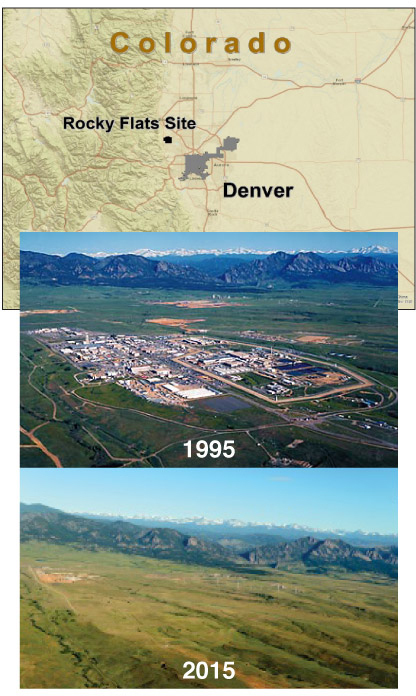 The Rocky Flats Plant, located outside of Denver, Colorado at the base of the Rocky Mountains, was a 10-square-mile facility in the DOE’s nationwide nuclear weapons complex (Figure 15). From 1951 to 1992, DOE and its predecessor agencies manufactured both radioactive and nonradioactive metal parts, primarily for nuclear weapons. The site mission changed in 1992 to decontamination and decommissioning of all nuclear facilities, and cleanup and closure of the entire site. The cleanup schedule and budget were compressed considerably by completing many remediation activities as interim measures, leaving the final site wide remedy decision to the end. One of the U.S. Government Accountability Office (GAO) reports (2006) on the Rocky Flats cleanup effort stated: “An accelerated cleanup process allowed cleanup actions to proceed much more quickly and collaboratively than a traditional cleanup process would have allowed.” The report recommended that the Rocky Flats approach be applied as a lesson learned at other DOE sites. Physical cleanup was completed in October 2005. The $7 billion cleanup was the largest environmental cleanup of a CERCLA site at that time and was completed in an accelerated 10-year schedule. Over 800 structures were decontaminated and demolished, including five major plutonium facilities and two major uranium facilities. An additional 421 areas thought to have been contaminated with hazardous substances were investigated and remediated if necessary. The Corrective Action Decision (CAD)/ROD document that closed the site divided it into two parts: a closed/delisted area and a long-term management area. Most of the site meets unlimited use/unrestricted exposure criteria and was delisted. The U.S. Fish and Wildlife Service now operates this area as a wildlife refuge. The former production area (Central Operable Unit) was also closed, but has use restrictions with requirements for long-term monitoring and maintenance of groundwater treatment systems and landfills. This case study describes one of four groundwater plume treatment systems being operated on site in postclosure. The Solar Evaporation Ponds (SEPs) were used primarily to store low-level radioactive wastes contaminated with high concentrations of nitrate (DOE 2002b). The first pond was constructed in 1953, and eventually five ponds were in use. The SEPs were also used to dispose of various other difficult-to-treat wastes including cyanide wastes, acid wastes, radiography solutions, sanitary landfill leachate, sewer sludge, treated sanitary sewage effluent, reverse osmosis treatment plant brine, and contaminated groundwater. While their main purpose was liquid waste storage and evaporation, most SEP water was treated by a flash evaporation system and some pond effluent was discharged to a sanitary wastewater treatment plant. A variety of liners were constructed, all of which eventually leaked to some extent. Leakage from the SEPs created a mixed uranium and nitrate/nitrite plume, which covers about 50 acres (DOE, USEPA, and CDPHE 2012). A smaller organic compound plume is colocated within the main Solar Ponds Plume (SPP). Because these contaminants are now present as secondary sources within a low-permeability matrix, it will take many decades to bring the SPP to standards. Treatment is included in the budgetary baseline through 2089. Groundwater modeling performed for the SEP decision document (DOE 1999) indicated that groundwater adjacent to North Walnut Creek would continue to exceed 100 mg/L beyond the modeled period (year 2100). Beginning in 1970, the plume was collected by a groundwater interceptor trench system (ITS), which was a series of trenches to which an array of French drains was later added. The purpose of the ITS was to collect contaminated water that drained by gravity to a pump station located near North Walnut Creek and was pumped back uphill to the SEPs. The French drain included gravel backfill from the drain to the surface so that it would collect both groundwater and surface water runoff. This extension of the original ITS also collected footing drain flows from major plutonium processing buildings. Beginning in 1993, water collected in the ITS was transferred to storage tanks prior to a flash evaporation process. The evaporation process treated two to three million gallons every year at the cost of approximately $2 per gallon. The SEPs were drained and activities began in 1986 to remove the pond sludges, a process completed in 1995. Removal of the sludges eliminated the nitrate and uranium source for the SPP. The SEPs were RCRA interim status units, which were closed in 2002 following accelerated remedial actions (DOE 2002b). Those accelerated actions also closed other RCRA units within the SEP Area of Concern and removed soil with contaminant concentrations greater than soil action levels (DOE, USEPA, and CDPHE 2003). Contaminants included plutonium, americium, and cadmium. After these removal actions, results of a risk assessment indicated low risk to future users from the former SEPs, therefore the final decision document (DOE 1999) required no further action at this source area. As a best management practice, the berms surrounding the SEPs were pushed in, clean fill soil was brought in and the area was regraded. This accelerated action was confirmed and approved as a final action by the CAD/ROD in September 2006. A study conducted in 1997 (DOE 1997) identified more detailed site characterization that was necessary to complete a robust evaluation of the remedy alternatives. The SPP was already characterized by data collected at 66 existing groundwater wells; 19 other wells were sampled to establish background and impacts to surface water. Prior to designing a treatment system, additional wells were installed to enhance the conceptual site model and to develop a groundwater flow model for a fate and transport evaluation of site contaminants. The SEPs were located on a flat surface at the edge of an alluvial pediment. The Quaternary alluvium is up to 23 feet thick and overlies poorly lithified weathered and unweathered Cretaceous claystones, which include incised sandstone lenses that direct groundwater flow. Colluvium covers the slope down to North Walnut Creek. Groundwater flow is mainly restricted to the alluvium/colluvium and weathered bedrock (Upper Hydrostratigraphic Unit); competent bedrock contains very little water. Hydraulic conductivity in the alluvium is typically about 10-5 cm/sec (3.0 x 10-1 feet/day). Flow is to the east beneath the SEPs, where it is bifurcated by a bedrock high and by proximity to the hillside. Most of the plume is mapped downslope to the north-northeast toward North Walnut Creek; a smaller portion is mapped south-southeast toward South Walnut Creek. Most contamination is in the plume portion that flows north-northeastward toward North Walnut Creek, which is approximately 1,000 feet north of the SEPs and 100 feet lower in elevation. In the source area for this segment, nitrate levels reach 4,500-5,000 mg/L; uranium concentrations have been measured up to 1,000 µg/L (Figure 16 and Figure 17). As the site closed, impervious surfaces (pavement, buildings) were removed and sources of imported water were turned off. Natural groundwater recharge conditions were gradually restored. These postclosure conditions generate less than half the previous stream flow in Walnut Creek. This much lower natural flow revealed the natural uranium concentrations that had been masked by the diluting effects of the extra runoff from impervious surfaces and the imported water. Colorado’s geology accounts for elevated concentrations of natural uranium in the area groundwater—above the maximum contaminant level (MCL) of 30 µg/L in many cases. The largest vein-type uranium deposit in the United States is located approximately five miles southwest of Rocky Flats. Natural uranium is composed of three isotopes in the following approximate percentages: 0.006% U-234, 0.72% U-235, and 99.27% U-238. Well samples collected within 100 feet of the SEPs indicate the presence of both depleted uranium and enriched uranium. The well samples that indicated an anthropogenic source of uranium had activities between 6.5 and 1605.5 picoCuries per liter (pCi/L); samples that indicated a natural source of uranium had activities between 42.3 and 72.7 pCi/L. Figure 18. Walnut Creek drainage with monitoring locations (Navarro Research and Engineering Inc. 2017). 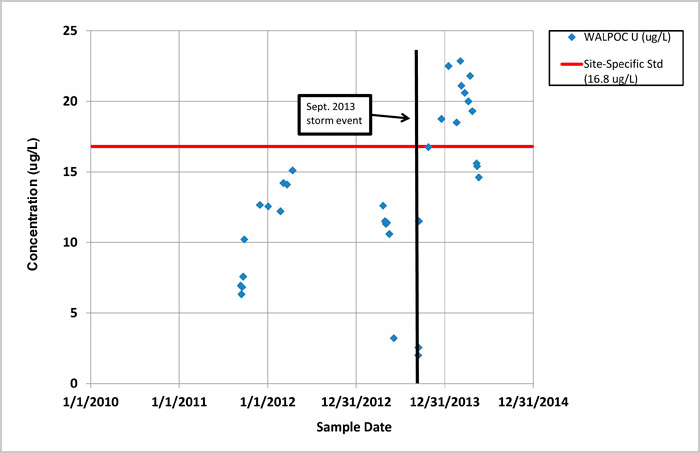 Uranium concentrations in continuous flow-paced composite samples collected at the point of compliance on Walnut Creek (WALPOC) were below the stream standard until a 100-year flood event occurred in September 2013 (Figure 18 and Figure 19). Immediately following the flood, uranium concentrations increased above the surface water standard and did not return to normal levels for approximately eight months (mid-May 2014) (Figure 19). Figure 19. Uranium concentration at WALPOC (September 2011 – May 2014) (Wright Water Engineers Inc. 2015). 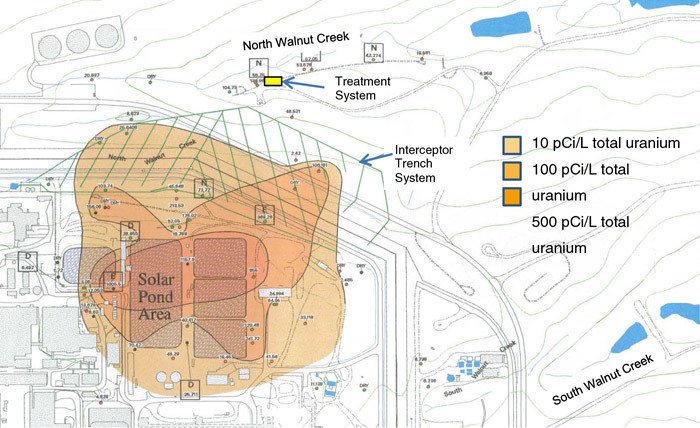 The major source of anthropogenic uranium in North Walnut Creek is the SPP. The average percentage of natural uranium at the monitoring location just upstream of the SPPTS at the time of this study was 92%, the highest measurement in the drainage (Figure 20). The effluent of the SPPTS, which discharges to the subsurface adjacent to the stream, averages 61% natural uranium and the percentage gradually increases in downstream monitoring locations until WALPOC, where 77% of the uranium is natural. The percentage of natural uranium does not vary substantially with changes in measured uranium concentrations or stream flow rate. Four chemical processes (precipitation, complexation, sorption, and colloid formation) generally control uranium concentration and mobility in aqueous environments. These processes are influenced by redox potential, pH, and water quality, which determine the aqueous speciation and dissolved/solid equilibria of uranium and thereby govern the movement of uranium in the environment. Of these three factors, redox potential generally has the greatest influence on uranium behavior in the environment, because it determines the state in which uranium occurs. Reducing conditions (negative redox potentials) – relatively insoluble and less mobile uranium species form and sorption to matrix solids is enhanced. Oxidizing conditions (positive redox potentials) – more soluble and mobile species are formed. groundwater that is rapidly recharged by oxygenated precipitation. Because redox reactions are reversible, soluble uranium species that have been reduced to low solubility uranium species can be reoxidize In water, sediments, and soils with negative redox potentials, oxidants other than oxygen, such as nitrate, can restore and maintain significant levels of soluble uranium species. In segments of North Walnut Creek affected by the SPP, the presence of nitrate is one of the most important chemical characteristics of the surface water and groundwater affecting uranium mobility. In-stream monitoring locations have measured nitrate concentrations as high as 140 mg/L (as nitrogen) as recently as December 2012. High levels of nitrate in oxygen-depleted groundwater and surface waters can facilitate the microbially mediated oxidation of immobilized uranium species to highly mobile dissolved species. (Wright Water Engineers Inc. 2015). When the original Solar Ponds Plume Treatment System (SPPTS) was installed in 1999, it was designed to passively capture and treat the uranium and nitrate-contaminated groundwater. The permeable reactive barrier option was modified to incorporate an impermeable groundwater collection wall with a subsurface treatment vault containing the reactive media. This design has also been applied at two other groundwater treatment systems at Rocky Flats and accommodates the low flow rates at the site. The design also allows more control over treatment rates and reduces the effort required to change out the reactive media. A trench, approximately 20 to 30 feet deep and 1,100 feet long, was dug into the colluvium, cutting across the plume and sloped toward treatment cells. An impermeable barrier consisting of 80-mil high-density polyethylene panels was installed in this trench. These 15-foot-wide panels are anchored in claystone bedrock and sealed at the bottom with bentonite. A four-inch perforated groundwater pipe (bedded in sand laid on top of the bentonite) collects the groundwater and routes it to the treatment cells. The collection trench cuts across the preexisting ITS, and the portion of the ITS upgradient of the trench was used to enhance groundwater collection. A concrete treatment box, 46 feet by 21 feet, was installed below grade, extending 25 feet into the subsurface. Originally intended to be constructed adjacent to North Walnut Creek, it was moved 400 feet upgradient out of the drainage to avoid the habitat of the Prebles Meadow Jumping Mouse (a federally listed endangered species). This move reduced the head at the lower end of the collection system and required a 12-foot head to build up in the collection trench before water could flow into the treatment box. A solar-powered sump pump was later installed to more effectively lift the collected groundwater up into the treatment box. Because the SPP is a comingled plume, it requires phased treatment. Within the treatment box, two cells generally operated in series. The first cell was filled with sawdust (as a carbon source) mixed with zero-valent iron (ZVI) and removed nitrate. The second, smaller cell was filled with ZVI and gravel to treat uranium. Effluent was piped to a subsurface discharge gallery near the creek. System influent and effluent grab samples are routinely collected for uranium and nitrate. Downstream, automatic flow-paced samplers collect surface water samples for uranium; downstream nitrate is collected as grab samples. The original SPPTS was effective in lowering uranium and nitrate concentrations, but by the time effluent discharged to the stream, it had become recontaminated by mixing with plume water that had not been captured by the interceptor trench. Although the SPPTS is not consistently meeting treatment targets, the system continues to reduce uranium and nitrate load while improvements are being implemented. The reduction in uranium load through the SPPTS (influent load compared to the system effluent) varies widely over time. The most effective uranium treatment, better than 80% removal of uranium, occurred in early 2011. Since then, the system’s overall effectiveness for uranium removal has trended downward while the uranium concentration in discharges to the stream has trended higher. The uranium load contributed from the SPPTS effluent to the stream has been estimated at 5%. When the SPPTS has been least effective removing uranium, uranium concentrations downstream have not increased, which suggests that SPPTS effluent does not have a significant effect on uranium concentration in North Walnut Creek. The treatment system design has been revised to overcome operational limitations and upgraded several times since site closure to improve system effectiveness. The lack of line-power has substantially limited treatment options. Because the SPP is a mixed contaminant plume, it requires phased treatment and so treating the contaminants with different methods and media and in the right sequence continues to be challenging. Treatment system repairs and maintenance, including plumbing reconfigurations and media replacement, have been costly. Treatability studies were initiated to increase system effectiveness and reduce maintenance. Batch tests evaluated a variety of microbial inocula (such as sewage sludge, manure, and soil), water additives (such as phosphate and yeast extract), carbon sources (ethanol, methanol, corn syrup, and others), and substrates (pea gravel and plastic high-surface-area media) to support microbiological denitrification. Optimization tests were run using different flow rates and additive application rates, as well as different organic media (sawdust, composts, corn stover, and others) that represented a combined carbon source and substrate. Treament system components are currently evolving from flow-through reactive media to lagoons for nitrate treatment, and a different configuration of flow-through ZVI for uranium treatment. 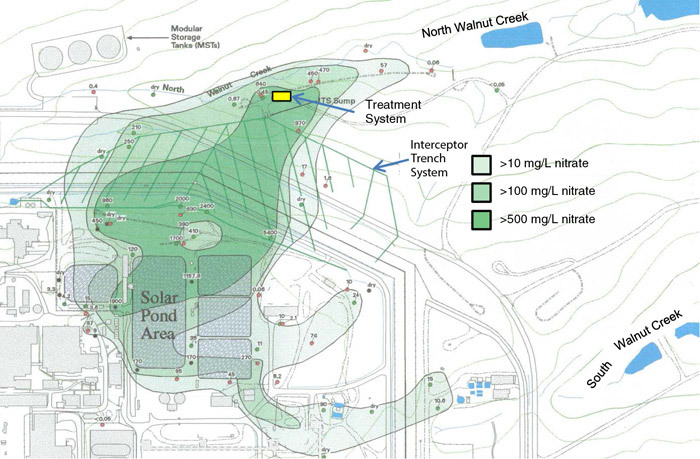 The Walnut Creek drainage study indicated that effective control of the uranium content in surface water must consider nitrate treatment, because nitrate can facilitate uranium mobility through oxidation processes. Preliminary samples show a dramatic improvement in nitrate effluent from the system. The September 2016 samples measured nitrate + nitrite concentrations of 65–90 mg/L as nitrate; after the treatment system became operational in October 2016, samples were nondetect for nitrate. 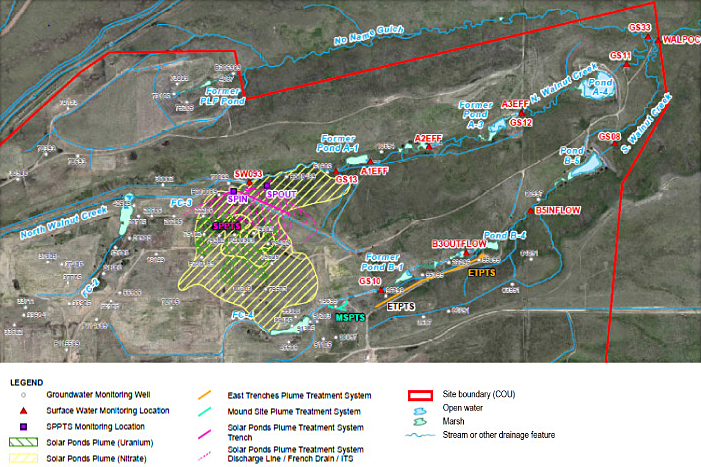 The Rocky Flats Legacy Management Agreement (RFLMA) (DOE, USEPA, and CDPHE 2012) requires that each groundwater treatment system “will be monitored, at a minimum, for untreated influent and treated effluent, and for impacts to surface water downstream of the effluent discharge point.” RFLMA also establishes sampling criteria and decision-rule flowcharts for the treatment systems. The systems must be maintained to ensure the effluent meets state surface water quality standards. Meeting surface water standards in every stream on site was also a RAO in the Rocky Flats CAD/ROD. That RAO is generally met at all surface water points of compliance at the site boundary; however, surface water does not always meet surface water standards at monitoring points in the Central Operable Unit upstream of the points of compliance. The applicable surface water standards have changed since the treatment system was installed. The original standard for nitrate was 100 mg/L, which is the agricultural standard applied on a temporary basis during the cleanup period. In 2009, that temporary modification reverted to the underlying standard, 10 mg/L—an order of magnitude difference. The original uranium standard at the Rocky Flats Site was 10 picocuries per liter, an ambient value calculated for the Walnut Creek drainage. Although not applied at the site, in 2011 a new statewide Domestic Water Supply standard for uranium of 16.8 μg/L–30 μg/L (30-day standard) established by the Colorado Water Quality Control Commission took effect. This standard is measured in units of mass per volume of water, versus radioactivity per unit volume of water as previously measured. The 16.8 μg/L lower limit of the statewide stream standard for uranium is based on protection of human health from chemical toxicity. The 30 μg/L upper limit of the statewide stream standard for uranium is the USEPA drinking water MCL. Instead of the statewide standard of 16.8 μg/L–30 μg/L, a separate regulation establishes a site-specific uranium standard of 16.8 μg/L, the lower end of the range for the statewide standard for stream segments on the Rocky Flats Site. According to the RFLMA, compliance with the 16.8 μg/L stream standard in Walnut Creek is monitored at the Walnut Creek Point-of Compliance (WALPOC) monitoring location. Per RFLMA, at WALPOC, a 30-day average concentration of uranium that exceeds 16.8 μg/L defines a “reportable condition” (regulators are consulted and the public is notified); a 12-month rolling average concentration of uranium that exceeds 16.8 μg/L also triggers an evaluation of compliance with the remedy performance standard. Additional samples were analyzed using high-resolution methods to determine the isotopic uranium distribution. Flow-paced composite samples analyzed on a two-week turnaround were continued. The ongoing geochemical study was used to evaluate the effects of environmental variability on uranium distribution. The source has been removed. A treatment system has been installed. Groundwater and surface water flows are greatly reduced. Use of the stream segment as a water supply is prohibited by agreement and by an environmental covenant with the state. Surface water exiting the site (via Walnut and Woman creeks) is now diverted around two downstream reservoirs and therefore no longer affects drinking water supplies. A use attainability analysis may be performed to determine if the stream segment cannot attain the standard. A postclosure ambient concentration can be calculated to apply as a stream-segment-specific standard. Actions taken in response to exceedances of standards or to upgrade treatment systems are reviewed and approved by the Colorado Department of Public Health and Environment. These action approvals, as well as regulatory consultations, are documented in contact records, which are made available to the public by posting them on the Rocky Flats website and notifying interested members of the public. Significant modifications to the remedy decision or to the RFLMA require a public comment period. The Rocky Flats Stewardship Council is a forum of local government officials and stakeholder organizations. This organization has met regularly since site closure to inform these governments and stakeholders of monitoring results, current issues, and actions. These meetings also serve as an opportunity for the interested public to interact. Because the Central Operable Unit has ongoing groundwater treatment and use controls, CERCLA Five-Year Reviews are necessary. Although public comment is not required, the Rocky Flats Stewardship Council provides occasions for discussion of the Five-Year Review topics and the continued protectiveness of the remedy.